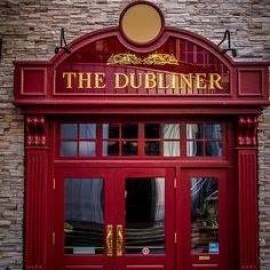 The Dubliner is a little slice of Ireland conveniently located in the heart of Downtown Kansas City. Our woodwork was handcrafted in Ireland, then made its journey across the Atlantic Ocean to what we call our "home away from home". Our restaurant's intricate details reflect a true Irish ambiance that wows each guest as they step into the building. The Dubliner boasts a menu of traditional Irish and American fare accompanied by an extensive list of beer, wine, and spirits- both local and from across the world. We have daily food and drink specials, including a killer happy hour! 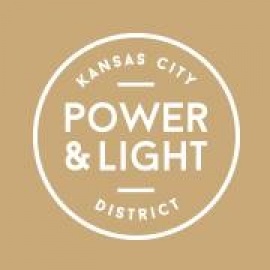 Come by before or after a concert for dinner and cocktails as we are conveniently located across from the Sprint Center. Local musicians liven up our pub when they take our stage on Fridays and Saturdays. Our dart board and pool tables on our Upper Emerald Isle are the perfect place to unwind with family and friends. We can accommodate groups of all sizes, from 4 to 400 people! The Dubliner is a great location for your next happy hour, reunion, birthday celebration, or special event. Come celebrate with us today! 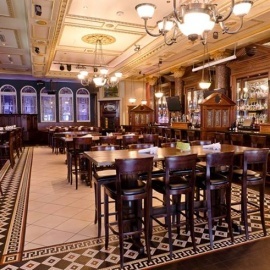 Classic, warm hangout with Irish pub grub & top-shelf spirits, plus live music, darts & pool tables.